All the way back in May, I shared a photo of two young Greenspire Linden Trees that I had begun to prune to be two-dimensional with the hopes of - once we moved into our #newoldfarmhouse - that I could try my hand at espalier or pleaching of the trees to train them into a specific habit. Back in July, in a post on the blog about our new fence, I pointed out the final placement of these Lindens right next to the southern lot line butted up against the 6' portion of our cedar fence. 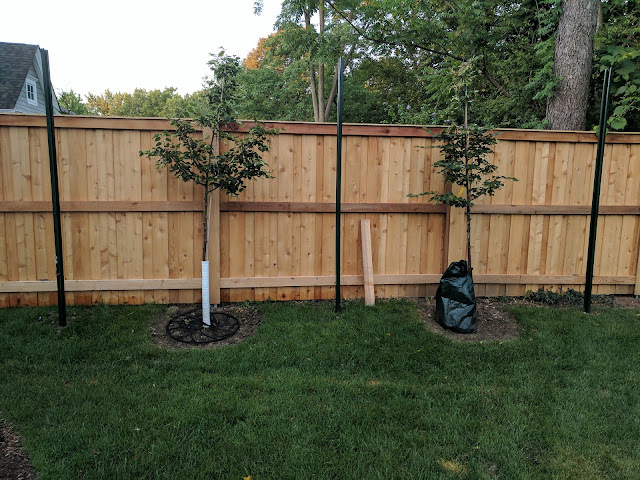 I got these in right after the fence was installed and then began to plan out the framing/system that I was planning on using to create the espalier. Over the past week or so, I have made some additional progress on the setup that you can see above: the three posts have been installed in the ground. I ended up shopping around and ultimately buying these 10' green 12 gauge steel sign posts from Grainger. Grainger has a location on Ogden Avenue in Downers Grove and like a lot of places, they have a free 'ship to store' offering, so all I had to do was drive over there with the minivan and they helped me load them into the vehicle. They were quite a bit heavier than I was expecting and I suppose that is good due to the fact that they're going to be here for what I hope is quite some time. I brought the posts out to the #newoldbackyard and tried my hand at driving them into the ground. I'm NOT setting these in concrete and wanted to just get them 2' in the ground, so I had 8' of post above grade to work with for the espalier. I marked the 24" spot on the posts so I knew that they'd be in an equal depth. After getting up and down on a ladder and using a sledge, I ended up getting a post-hole digger out and dug down most of the 2 feet and then placed the post in the pre-dug hole. A few taps with the sledge to set it in the right spot depth-wise and a little magnetic level to ensure they were pretty close to level in both directions and I was pretty much done. Backfilled the holes and poked at them to be sure all the dirt had settled in around the posts and then moved on to the next. An hour or so later, I had all three posts in and they were - pretty close - to what I envisioned when I started. Now comes the hard part - ensuring that the frame is fail-proof, in terms of long-term reliability (weight and weather/freezing/heaving) and is appropriate to look at while the tree grows into its shape. I've mentioned this on the blog before, but for those of you who don't know what I'm talking about when I mention espalier'ing trees, you can read up here on Dirt Simple. The history of growing espaliers dates back centuries, to a certain French monk, Fr. Lergendre, who was entrusted with the important job of providing food for his monastery. In those days, providing food meant growing it. Some of his discoveries were made out of sheer need. He wanted to grow lots of fruit trees, as he had lots of people to feed. The trees planted closest to the monastery walls fruited more heavily and more reliably, as the flowers were protected from late frosts by the heat generated from the walls. As his space was small, and his need great, he moved them closer and closer to the walls. And closer and closer together. There were many varieties he wished to grow. Eventually he cut the back branches off of the trees all together. Amazingly, the trees he eventually trained to grow flat against the walls produced more fruit than trees cultivated in the open. His work over a lifetime was detailed in a book he wrote, “Palmette Legendre”, published in 1684. The art of training fruit trees to grow against a wall in formally pruned shapes has persisted to this day. 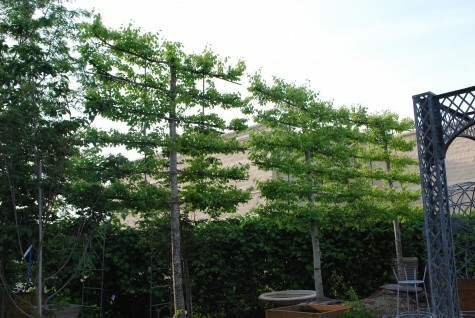 As for what Linden trees look like when trained or espalier'ed, check out the picture below - again from Dirt Simple. That's what we're going for - a somewhat formal training of horizontal branches of the Linden trees. As for the rest of the espalier'ing process for me, it involves bracing the posts against the fence (which I want to account for heaving of the posts but NOT of the fence), running galvanized wire across/in-between the post along with using turnbuckles and thimble/stops (and a crimper!) to make it look neat and tidy. The Lindens are - as you can tell - a long way away from looking like the more mature ones you see above, so the wires and frame are going to be 'showing' for quite some time. I'd be pretty disappointed if the frame/system of the espalier'd trees didn't show off in a pleasant manner for the next few years. I've given the braces some thought and I'll end up posting some photos about them, but I think the gist of the situation is that I'm thinking that I'll be using a cedar 2x4 that is fixed against the fence with pocket screws and has a channel cut out of it vertically that allows a carriage bolt with some big washers to kind of 'sit' in it. That way, when the posts heave during the winter, the bolt can kind-of 'move' with it while keeping everything in plane in at least one direction. I'll try to post the idea here to the diary so I can reference it in the future. Once that is done - or perhaps before it is done, I can then move on to the wire training lines. That's when the fun part starts to happen. All of this needs to happen soon because everyday that passes, the limbs and branches firm up and become less pliable and workable.